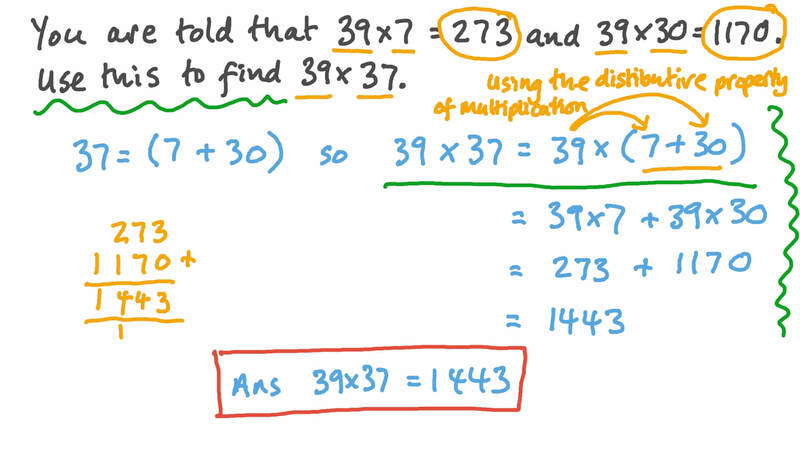 In this lesson, we will learn how to use the distributive property of multiplication over addition and subtraction to rewrite equivalent expressions and evaluate them. Complete the equation: 1 9 × 6 4 = 1 9 × ( 4 + ) . You are told that 3 9 × 7 = 2 7 3 and 3 9 × 3 0 = 1 , 1 7 0 . Use this to find 3 9 × 3 7 . Given that 2 1 × 3 = 6 3 , find 2 1 × 3 3 . Notice that 7 × 9 = ( 7 × 1 ) + ( 7 × 8 ) . Fill in the blank: 3 × 6 = ( 3 × 3 ) + ( 3 × ) . Fill in the blank: 4 × 5 = 4 × 7 − 4 × . Fill in the blank: 4 × 8 = ( 4 × 7 ) + . Which of the following equations demonstrates the distributive property? Evaluate 6 4 4 × 2 and 6 4 4 × 3 0 and then deduce the product of 6 4 4 × 3 2 . Calculate 7 × 7 . 3 mentally, using the distributive property. Evaluate 9 7 × 1 0 1 using the distributive property. Fill in the blank: 1 4 × = 1 4 × 4 4 + 1 4 × 5 6 .